Lighting the Tree: Friday 5th December saw Santa pay another visit to our village for the annual ceremony of the 'Lighting of the Christmas Tree'. This year the lights were switched on by Elspeth Bonds, Head Mistress of Theydon Bois Primary School who also provided a choir which joined the Theydon Bois singers in leading the carols. The audience later enjoyed mulled wine and mince pies in the village hall and the children present each met Santa & received a gift. For more pictures of the event Click Here. Parish Council Minutes: for 27th November 2003 are now available Click Here or go to the Parish Council Pages on the menu. Volunteers Required: CAN YOU VOLUNTEER FOR AN HOUR OR TWO A MONTH TO HELP PEOPLE WITH CANCER? THEYDON BOIS VILLAGE ASSOCIATION: This is the organisation is responsible for the management of the Village Hall, it's car park and the surrounding area - in all, nearly two acres in size. There are some 32 affiliated organisations, each having a representative on the Council of Management, which meets twice a year and has the ultimate responsibility for all major decisions appertaining to the Village Hall. There is an Executive Committee, meeting monthly, dealing with all other routine issues including, of course, the management and maintenance of the Hall and grounds. This Committee is served by fourteen volunteers elected by the Council of Management and including a representative of the Parish and District Councils. In addition, the Chairman and Vice Chairman meet with the paid employees - the Hall and Bookings Manager, the Key Holder and the Cleaner in the week prior to the monthly Executive. A major issue being reviewed recently has been the impact of skateboarding at the Village Hall. The Executive Committee is extremely concerned about the damage being caused to the paving and especially the steps surrounding the Hall and the considerable risk to users and cars in the car park. Skateboarders have been warned on many occasions and asked to 'elect' two or three people to act as spokesmen in an endeavour to create a dialogue to discuss their requirements. To date, this has not happened. The Village Association, in conjunction with the Parish Council, would urge parents of skateboarders living in the village to encourage their youngsters to make contact through the post-boxes at the Village Hall. Regrettably, the decision has had to be taken that all skateboarding at the Village Hall has to be prohibited in the future. Theydon Bois Community Tree Strategy: Progress continues towards finalizing the arrangements of the plan and it is hoped to commence planting of the trees next May. This will be on a five year schedule with completion by March 2008. Village Green: continued good maintenance. Street Tree Planting: all roads have been surveyed and positions located where tree planting is advisable. Professional advice is being given on tree types. Buffer Land: Replanting where trees were lost through the Elm Tree disease. Memorial Trees: The Parish Council have been contacted by some people who would like to have a tree planted in memory of a loved one. We wish to include these in our programme and have obtained a quote from EFDC (Parks and Leisure Dept.) of £100 per tree to supply and plant. We have also received a quote from an Epping Firm for the plaque at a cost of £40 plus fixing. These must all be of one design and size. We are currently discussing three options where these trees may be planted, one being in verges along the roads, the other two we expect to finalise shortly after discussions now taking place. We hope some of our residents will wish to take part in this scheme, in memory of a loved one. Those interested should contact the Parish Council Office on 01992 813442 or drop a note into the office at the Village Hall. Theydon Bois Community Tree Strategy (formed by: The Parish Council, Epping Forest District Council, Corporation of London Epping Forest, Theydon Bois Tree Wardens, Theydon Bois Rural Preservation Society). Keep our Verges Clear: Following the notice that appeared in the October edition of the Village News we are pleased that there does appear to be an improvement in keeping the verges in the Village clear. We are repeating the details as a few people are still not co-operating. The Parish Council liaises with EFDC in an effort to maintain the appearance of the verges in the Village. Unfortunately, we still have problems where residents put blue boxes and sacks on the verges, some, days in advance of collection. Please remember bags and boxes should be placed within your property at the front boundary for collection days. Pavement areas and verges must be left clear at all times. LET US ALL DO OUR BEST TO KEEP OUR VILLAGE LOOKING CLEAN. 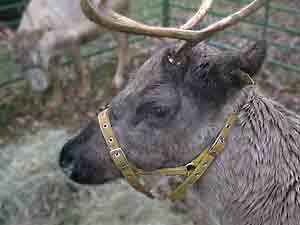 Santa's Reindeer Visit Theydon Bois: Taking time out from his busy Christmas schedule Santa visited the Primary School together with his live Reindeer (courtesy of Paradise Wildlife Park) on Saturday 29th of November for their Christmas German Fair. Despite the heavy rain (should that be Rein?) many children and adults came to visit Santa in his Grotto and to buy presents from the fair for friends, family, teachers and children. It seemed that some stalls had virtually sold out within an hour of opening, so popular and reasonable priced were some of the gifts. There was lots going on and you could not recognise the school hall which was transformed by the stalls with all their decorations. There was certainly something for everyone including Indian Head Massage for those already feeling the stress of preparing for Christmas. For more pictures of the fair Click Here. War Memorial: How good it is to see the War Memorial now standing proud in the grounds of our Parish Church following the cleaning of the stonework. This work, which was arranged by The Parish Council, was carried out by J Day & Son of Bishop's Stortford, who are specialist Ecclesiastical Masons. They carried out similar work when the memorial was previously cleaned 6 or 7 years ago. This time the low walls to the surrounding garden area were also cleaned. It was essential that the work was completed before Remembrance Sunday, and, at the service the Vicar, Rev. Canon Colin Travers, expressed his appreciation. Appreciation was also received from Harry Memory who represents the Royal British Legion. We must particularly thank the working party from the Parish Church who replanted the surrounding garden a few days before the service and who upkeep the area throughout the year. Our very special thanks are also due to the anonymous donor from our Village who paid the whole cost of the works involved. We are very grateful for their kind generosity. The Village News & The Village Web Site have recently run a "Christmas Card for Our Village" in conjunction with the Primary School. All classes at the school participated and a 1st and 2nd Prize were awarded for each class, with an overall winner. Judging took place at the Village Hall on Tuesday 25th November and the judges comprised (left to right in photo) Cllr. Sheree Powell, Parish Clerk - Madeleine Murphy, Village News Editor - Tony Ames, Web Site Editor - Jim Watts and Cllr. Martin Oliver. All the judges commented on the extremely high standard of entries which made it very difficult for them to decide the winners. Finally it was decided that the prize for the overall winner should be awarded to Matthew Howard of Class 5/6M for his very creative entry that fully conveyed the sprit of Christmas night. Howard wins a painting set as his prize and will also soon see his card used as the front page of the Christmas Edition of the Village News and on the opening page of this Web Site for the Christmas period. A limited edition of his card will also be produced for circulation by the Parish Council. Howard's and all the other prize winners are now on the Web Site for you all to see. Congratulations to all the winners and for the those that didn't win we are sorry that we could not get all your excellent entries on the site, remember the decision was very close, better luck next year. The AGM was well attended on 20th November. It was reported that our Show would revert back to July next year, although we had had the advantage in September of the school children bringing their exhibits to the Hall themselves as it was in term time. It was pointed out that the Society had donated money towards the publishing of the 'Tree Strategy' document and to the British Legion in memory of Syd Glozier. The Trading Secretary said that many products are no longer available due to the cost of companies having to test everything. He was disappointed that on three occasions Committee Members had spent time in the Trading Hut with no customers. His message - 'use it or lose it'. The subject of the Green Waste Collection was considered and it was thought we should ask for the collection dates be extended until at least the end of November, especially as this would result in less going to landfill sites which the Council has to pay for. The Committee was re-elected en-bloc with the sincere hope we could have some younger members in future. Any volunteers? Mount not to exceed 8" x 10"
WHO SMASHED THE SEATS AROUND THE POND? WHO WRECKED THE CHILDREN'S PLAYGROUND? WHO BROKE THE BUS SHELTER? WHO SHOT THE BABY DUCKS WITH AN AIRGUN? WHO HAS SMASHED MOST OF THE LITTER BINS? WHO HAS BROKEN SOME OF THE DOG LOOS? WHO BOMBARDED CUSTOMERS AS THEY LEFT THE QUEEN VIC THE OTHER NIGHT? WHO SMOKES DRUGS AND DRINKS ALCOHOL ON THE VILLAGE GREEN? WHO GATHERS TOGETHER IN LARGE GROUPS OF UP TO 30 MOST NIGHTS IN THE VILLAGE CENTRE? WHO IS GOING TO PAY FOR THE REPAIRS? THE PARISH COUNCIL ARE HIGHLY AWARE OF THE EVER ESCALATION OF VANDALISM IN OUR VILLAGE. WE ARE TAKING STEPS TO INCREASE DETECTION. PLEASE HELP WITH PREVENTION. - Passenger Transport Newsletter is now produced twice a year (Autumn/Winter and Spring/ Summer). A copy will be available for reading at the Parish Office. The latest edition informs of Chelmsford Bus Station being redeveloped in the Summer of 2004. - A Public Transport Customer Satisfaction Survey to be taken annually (let's have your opinions ). Bus Stop Information Programme is being introduced in recognition of the Bus Stop being the passenger's first point of contact with the public transport network. A three year project will provide the public with a greater awareness of transport services. -School Transport Entitlement, Changes to Policy. From September 2004 Essex County Council will provide free school transport for children of compulsory school age to their school subject to 2 miles for children under eight years old and 3 miles for those over eight years old. There are several other qualifying points so if you need further information please contact the Parish Clerk or Brian Catt, Senior manager, Planning and Admissions, Essex County Council 01245 436700. - One other item which will help young folk is Essex Learning Access Scheme. This is a new scheme to help those in the 16 to 19 age group to continue with post 16 education. Such problems as difficulties in travailing, disabilities or special needs can be overcome. Again, contact the Parish Clerk and we will see what we can do. the Countryside Agency and they pass it on to County. Up to £10000 is available but like everything else theses days, it is subject to various conditions. One important start is for a village survey to be conducted and with this in mind, contact will be made with County to see exactly what is required. We will let you know, as matters progress. It was another successful Poppy Appeal in Theydon Bois this year with a grand total of £2,883.65 collected for the Royal British Legion. Thank you to all the collectors and to the residents of Theydon Bois who gave so generously. The Month in Theydon: The October installment of Trevor Robert's interesting review is now on line. Click here. Click Here to go direct or view all available Newsletters at the new Newsletters link on the menu bar. Newsletters: We have now added all of the 2003 issues of Village News in PDF format to the Web Site for you to download. As stated earlier Village News is under going some improvements and it is hoped that from next year at least some of its pages will be in colour. To give you some idea of what it will look like the October PDF version on this site is in colour and we hope that all future downloadable versions will be also. We think that the Village owes Tony Ames and all those involved a debt of gratitude for all the hard work they put in on the Village News. We have also added the second two weeks of Chris Caten's Beat Mobile Neighbourhood Watch Newsletter to the October issue. Please make sure you look at this to check out the current scams that are going on in the district. Click Here to go direct to the Newsletters List or view all available Newsletters at the new Newsletters link on the menu bar at anytime. We have had further e-mails about British Telecom and Broadband in Theydon Bois, as far as we know the position has not changed from our article posted last month. Check it out if you want to know more or register with B.T. Christmas Already! : This years Lighting of Christmas Tree will be on Friday 5th December. 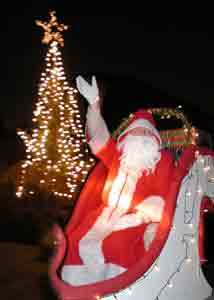 Festive fun in front of the Village Hall at 6.30 pm with music, carol singing and the arrival of Father Christmas. Add it to your diary now and come and enjoy a glass of mulled wine and mince pies. Parish Council Report: The report on the Parish Council Meeting on Thursday 25th September is now available. Click Here. The next public meeting is Thursday 28th November at 8.00pm. Closure of Theydon Road (from High Road to Ivy Chimneys Road) from 20.10.03 to 01.12.03. Under the instruction of EFDC Highways this road needs to be closed to through traffic to avoid severe traffic disruption on the High Road and High Street, whilst work takes place renewing the water main between Bury Lane and the entrance to Copped Hall. Residents will have access to their properties. TVW will take the opportunity to complete all other work that needs to be done in Theydon Road while the road is closed. Duration 6 weeks. The course is open to all village residents, men and women, over the age of 16. To book a place(s) please leave your name, address, and phone number in an envelope at the Parish Office in the Village Hall. We will phone you back to confirm your place. Bookings will be taken from the 1st of November. Book early, places are limited. Parking blues: Our village has a parking problem that is made worse by all-day parking by commuters to London. The Parish and District Councils are currently addressing this matter, but there is another, more serious, problem. Just take a look at your own road ­ how many vans and cars are left on the roadway, on the pavement, on the greensward (in fact anywhere that you can get a vehicle) with the exceptions of the driveway and the garage? Some people say that they deliberately park on the road to prevent others from using the space. Others have converted their garages into living spaces and yet others have loads of junk in their garages. Do we want the greensward to look attractive and be part of our environment and not to be ripped to pieces by careless parking? If the answer to these is Eyes, then we must all make a conscious effort to move our vehicles off the road by using the garage and driveway. We might also save ourselves the cost of repairing damage caused by careless drivers negotiating over-parked areas. Please look around ­ am I guilty of causing an obstruction or an eyesore with my transport? Let us all conserve and preserve our environment by removing our vehicles from the roads and pavements onto our own property. This is our village, let us look after it. The Theydon Bois Womens Institute: renowned for their expertise in organising coffee mornings, afternoon teas and, of course, cake making, has once again put their efforts to good use this year. Charity begins at home, they say, and at their October meeting, a cheque for £616.50 was presented to the Playground at Theydon Charity (PAT). PAT is organised by a band of volunteers who have worked hard over many years to provide and maintain equipment for a playground. The playground is used by children up to eleven years of age from both the village and the local area. Funds are always required to maintain the high standards established by the founders of the playground in the early 1990s. A new centre activity frame was installed recently, funded with grants from a number of charitable organisations; however, there are other items of play equipment which the PAT committee would like to renew. Looking after a playground is an ongoing experience often demanding but, never the less, rewarding. Clare Tunks, assisted by baby Tunks and Liz Emmett, representatives of the playground committee were present to receive the cheque. The Month in Theydon: The September installment of Trevor Robert's interesting review is now on line. Click here. Important - Blue Bag Collection: The last collection day for garden waste is Monday 20th October. Please do not put any blue bags out after this date as they will not be collected. Theydon Art Group: hold their annual exhibition of paintings for sale at the village hall on Friday 14th November 6pm to 9pm and Sat 15th 10am to 6pm refreshments available. The Vandalism and Anti-Social Behaviour Group: in future will be known as Theydon Bois Safer Community Group last met on 2nd September 2003. We were fortunate to have in attendance at this meeting David Stone(ECC Youth Service) Team Leader for statutory youth service in Epping Forest District. We had all been given to understand that our Youth Club was ear marked for closure during the latter part of 2005 - however at this meeting we were informed by David that closure would take place within a year. This is a County Council decision and although we have a purpose built building Theydon Bois does not meet the deprivation criteria to make youth provision a priority. Those of us on this group feel our young people are being treated very badly indeed. We had a lengthy debate where our concerns were raised. Believe me - a full report would take all the available space in this newsletter. But nobody could doubt the depth of our feelings at the loss of this facility for our young people. David was very sympathetic with our concerns but was stuck with the decisions made at County level. Theydon Bois together with other clubs in the area will close and a main centre is planned for Loughton, however, when this centre is likely to become a reality is anyone's guess. In the meantime Theydon Bois has a youth leader and two youth workers on site and will continue to open for two evenings per week. This will be advertised and publicised. A Youth Audit is planned and when the club closes there will be staff and mobile resources available. We mentioned in the past a Safety Course - it is proposed that this will take place in January 2004 - Details will appear in the next issue of the Village News and will also appear on the Village Web-Site. Numbers will be strictly limited so if you wish to attend this course please respond quickly. ACTION GROUPS: Following on from the Public Meeting last year, it was decided to form two Action Groups to help tackle burglary and anti-social behaviour in the Village. The Groups have been meeting regularly and have made some good progress to date. However it was always recognised that this is a continuing job, (there is no "quick fix", sadly) and we think the time is now right to streamline the procedures. "Theydon Bois Safer Community Group"
More volunteers who care about the quality of life in our village, particularly parents, are always welcome. The next Meeting will be in the Village Hall on the 16th October, why not come along? Theydon Bois Village Association: The Association is pleased to be able to report that most of the outstanding 'snagging' items have now been addressed, nearly two years on from the opening of the New Village Hall. Financially, all the build and furnishing costs have been paid for and there is a reasonable balance in hand to cover the running and general maintenance costs and a realistic reserve fund. Bookings are buoyant and our Hall and Bookings Manager - John Field (815150) - is at times strugglilng to accommodate all requests. This is all most encouraging; however, the Executive Committee is anxious that the Hall is available first and foremost to the residents of Theydon Bois and the 32 affiliated organizations. With this in mind, and with particular problems associated with weddings, the decision has been taken not to let the Hall in future to people living outside the Parish boundary for such events. Existing bookings will be honoured. In conjunction with the Parish Council, there is now a strong desire to ensure that younger people living in the village are encouraged to become more involved with established organisations and new ventures. Should anybody feel able to help develop this approach, would they please contact the Chairman - Norman Stanley at 813073. Essex Air Ambulance: The Essex Air Ambulance is an essential lifesaving service and is totally funded by donations from the people of Essex. We are currently looking for a voluntary representative in each parish to assist in the monitoring of fundraising in your area. Our ideal person would be able to collect donation tins from various locations, liaise with local businesses who wish to support the Air Ambulance and keep in touch with our fundraising office with news of events in your area. The role would suit someone with a few hours spare per month, great interpersonal skills, and a good sense of humour. League & Cup Triumph For Cricket Club: Theydon Bois Cricket Club have enjoyed one of their most successful seasons for many years with their 1st Xl clinching the Division 2 League Title in the Herts & Essex Observer Cricket League as well as winning the League Cup Competition. In an amazing display of consistency the 1st Xl won 17 out of 18 league matches in a season which was blessed with good weather. With the League Title having been won by a clear margin, further success was achieved when the Club won the League Cup Competition overcoming Stansted in the final. Of the main contributors to the Club's success were Paul Sartoretti who scored 926 runs during the season ably supported by Ross Penman who scored 807 runs. On the bowling front, Brett Sanders claimed 44 wickets with William Turpin taking 37 wickets at an average of 12.62. The 2nd Xl also enjoyed a good season with the side finishing 4th in the 3rd Division of the Herts & Essex League. Captain Alex Goldie enjoyed success with the bat scoring 679 runs. Club Captain Warren Hyde commenting on the season said that the Club had a good blend of youth and experience, but most important of all was that everyone was enjoying their cricket. Our decision to move to the Herts & Essex League a few seasons ago has proved to be a popular and successful one. The quality of the grounds, the standard of play and the manner in which the cricket is played have all exceeded our expectations. We have also been able to attract new players to the Club as well as re-launching a thriving Colts section where we welcome boys and girls from 8 years upwards. The Club is definitely on an upward trend. Things are also looking up for the Club off the field of play with planning permission being approved for a new pitched roof on the Clubhouse. This will not only improve the appearance of the Clubhouse, but will also enable the Club to improve the changing facilities. Further information on Theydon Bois Cricket Club can be found on their web site at www.tbcc.co.uk or contact Club Secretary Peter Gooch on 812908. Village News Sponsorship: As we reported earlier the village news letter is being re-vamped, we are now delighted to report that James Sear Estate Agents have become the main supporter for Village News for 2004. For the past 30 years James and Heather Sear have worked together in the property industry. Their combined experience, together with that of other family members and locally based office staff gives them a vast knowledge of local property. James and Heather were born, raised and still dwell in Theydon Bois. In fact the Sear family name can be traced back several generations in the village. Therefore they had no hesitation in agreeing to sponsor our new publication. We are also pleased to report that Theydon Bois Balti House in Station Approach has also agreed to sponsor all four editions next year. National Society for the Prevention of Cruelty to Children: A Coffee Morning will be held on Tuesday, 25th November at the Village Hall between 10.30am and 12.30pm. Coffee, Sherry and Mince Pies will be served. Cake Stall, Seasonal Craft Stall and Bric-a-Brac. BUSINESS NEWS: As part of the on-going development of Village News we intend to feature from time to time business developmentswithin the village. In this edition we are featuring Walker Blakeley Kitchens Ltd, situated in Coppice Row and The Flower Yard in Loughton Lane, who have proved a welcome addition to the village shops since opening a few months ago. Roger from Walker Blakeley Kitchen writes to Village News "We are delighted to have been able to open our new studio in this lovely village and look forward to serving the community and surrounding areas in the coming years. Whilst we are a new name in Theydon Bois, we have over 20 years experience in designing and installing high quality kitchens. Those villagers who have called into the studio so far, will know that it comprises of 3 showrooms each fitted with different styles from contemporary through to traditional. As well as the kitchens and home office on display, there are many other ranges to choose from, including solid wood and hand painted doors - the choice is endless! The service we offer covers everything from initial planning to final installation, this includes re-plastering, ceiling lighting, tiling, and blinds, indeed everything to give you the kitchen you have always dreamed of. As part of our aim to offer the village that little something extra, the studio is also well stocked with a stunning and unusual range of accessories for the kitchen and home. Our accessories make ideal gifts so if you are looking for that special birthday or wedding present it is well worth while popping in to have a look around. As Christmas approaches we will be offering an additional range of gifts and are planning one or two late opening evenings to ensure those of you who are unable to come in during our normal opening hours do not miss out. So, keep an eye on our window for further details and we hope you will be able to join us for a glass of mulled wine and a mince pie or two! You can rest assured that whatever you need, a warm welcome and the best advice awaits you and we look forward to meeting you in the coming months". Vince at The Flower Yard describes his business as "More that just a florist. As well as bouquets and flower arrangements he aims to provide a selection of seasonal and Mediterranean plants, gifts, handmade Cretan and Turkish urns, hand-painted glassware and quality silk flowers. At Christmas time there will be a selection of decorations and Xmas trees. PLEASE KEEP THE VERGES CLEAR: The Parish Council liaisons with EFDC in an effort to maintain the appearance of our verges and regular grass cutting takes place. We still have problems where residents put blue boxes and sacks on the verges, some times days in advance of collection. Please remember bags and boxes should be placed within your property at the front boundary on collection days. In the past there has been a problem where we found vehicles and materials were on some verges , action was taken and this situation has now improved. Epping Citizens Advice Bureau Advice Column: Question: Please help me. I am an elderly lady who is virtually housebound through arthritis, my fingers are twisted and I have great difficulty in filling in forms. I have just received forms for Attendance Allowance, but they look so complicated that even if I could hold a pen for any length of time, I would not know where to start completing them. Unfortunately, my family do not live near me, so I cannot ask them for help. I do not know where to turn. I have no savings, with only the basic state pension, topped up with Income Support to live on. I understand that I would also qualify for more money, if awarded Attendance Allowance. This would make such a difference to my life, as I would be able to pay for the extra care and support I need. Answer: The Epping Citizens Advice Bureau Home Visit Worker will be happy to visit you and complete your Attendance Allowance forms. If you are awarded this benefit you will get at least an extra £38.30 a week. In that case your income support might also increase by £42.95 a week. Alternatively, if you find someone to care for you for 35 hours a week or more that person could claim Carer's Allowance. The Home Visit Worker visits elderly or housebound clients in their homes - by appointment to advise on Benefit entitlement and/or to assist in the completion of Benefit forms. To arrange an appointment for a Home Visit, please ring Rachel Poulter at Epping Citizens Advice Bureau on 01992 574989. If you have some spare time and would like to accompany the Home Visit Worker on visits, please contact Rachel Poulter at Epping Citizens Advice Bureau on 01992 574989. You would not need any experience or be involved in giving advice. Theydon Bois Village News: Earlier in this year (2003) Theydon Bois Parish Council took the decision to re-vamp its Newsletter, which had been produced in its existing format for a number of years. It is planned that the magazine will have more emphasis on village activities and will work in conjunction with the village web site to keep you as up to date as possible about the happenings and events in Theydon Bois. Revisions to the magazine began in April when discussions also took place with web site members with regard to making the magazine available in its published form online. Thanks to the hard work of Tony Ames (The Village News Editor) and Jim Watts (Village Web Site Editor) we are now able to make future issues available online in PDF format. The Newsletter links in the navigation bar to the left (which have been there for sometime) are now all active and we have a link to the free Adobe PDF Reader on the Magazines Listings page if you don't already have a version installed. Click Here to go to the new page. Royal British Legion: The annual Royal British Legion Service of Remembrance will take place on Sunday 9th November starting at the War Memorial at 10.45 am and then continuing in the Church. In the event of wet or bad weather the entire service will be held in the Church. Medals may be worn and standards carried. It has been decided that because of falling numbers in the membership of the Legion we will no longer march from the telephone exchange but will make our own ways to the War Memorial. Legion members and other adults please form a line on the pavement facing the War Memorial and the younger people congregate on the sides of the Memorial area in time for the start of the service. The Royal British Legion is a charity whose work is to help disabled service and ex service personnel and their families. Please do give generously when you see the poppy sellers around or if they call on you at your home, and please do 'wear your poppy with pride'. I would like to take this opportunity to thank all who have been involved with the poppy appeal over many years, the organisers and poppy sellers, you have done a grand job for the Royal British Legion. Theydon Bois Drama Society's: last production in 2003 will be 'Over the Moon' a comedy by Ken Ludwig which will run from 23rd to 25th October. They will then kick off 2004 with Theydon's first pantomime for 10 years! This will be 'Sleeping Beauty' by John Morley and will run from 7th - 10th January 2004. Make a note in your dairies now or contact Carol James at the Box Office. Tel: 01992 812250. Parish Council Meetings: Why not make sure you have a say in our our village is run or changes. We now have the full list of the Public and Planning Meetings of the Parish Council for 2002 & 2003. Click here so you know when you can attend. Strong Opinions? : Do you have strong opinions (as on any of the above the above subjects) or about what's good or bad in our village? The Web Site is thinking of starting an opinions page where you can have your say. Why not submit a short article of up to about 400 words for everyone to discuss. Either drop it into the Parish Office (preferably on Disk) or E-mail it to us at Opinions. Please contact us with your Latest News. E-mail: Content Manager or send copy to the Village Office. Preferably on floppy disk.